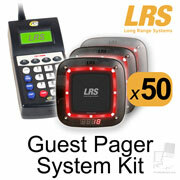 The standard kit includes red color guest pagers (model CS7 with dark gray top label and lights set to red color). Upgrade Pager Style: An upgrade to the AdverTeaser paddle pager is also available. Use options 2 below to order this style. Custom Systems: Please call 805-375-7000 to order custom systems. Choose Option 1 below for the standard guest system. Choose Option 2 below to upgrade to Adverteaser paddle-style pagers.